Posted On January 04, 2017 by Team iCynosure. The fast-approaching wedding season brings to the fore hustling brides-to-be looking for the perfect bridal ensemble. The yearning to stun all eyes overwhelms the need to switch pause. It is absolutely not incomprehensible either as weddings are events that create memories for life, memories that are passed down to future generation as inspiration. Jewellery forms one of the three core components of the wedding ensemble; bridal attire and footwear being the other two, and therefore it is not surprising to see brides on a lookout for the perfect jewellery to go with the rest of her attire. Amidst an all-consuming whirlwind of wedding preparation, we try to simplify the jewellery shopping experience by providing brides-to-be with a dictionary of necklaces along with tips on who should pick what. Measuring between 14 to 15 inches, chokers settle high on the neck. Women with swan necks should totally go for these as they enhance their look considerably. Women with shorter or wider necks should go for necklaces with a length of 18 inches and longer. The shape of your face is also a factor in determining whether or not a choker would be a good idea. Women with round faces should avoid chokers as they make their faces look rounder. Instead, they should opt for something that forms a V around the neck. Those with oval or heart shapes faces, on the other hand, can carry these really well. This neckpiece style originally belongs to the South Indians, the biggest patrons of Gold. While traditionally, mango harams are made exclusively of gold, contemporary designs do have gems embedded into it. The length varies, so depending on your torso and face cut, you can pick the one that suits you the best. Besides, these look outright gorgeous with silks and so if you are wearing a gorgeous Kanjeevaram for your wedding, nothing can beat the charm of Mango Harams. This style departs from the traditional style in a major way, however, the high chic quotient makes it a perfect pairing for rich and royal outfits. Depending on your taste and attire, you can choose from a touch of embellishments of valuable gemstones. Additionally Meshwork jewellery is complimentary with your western outfits; so you can team it up with your lehenga or your evening gown. As the name suggests, these necklaces impart a glorious touch to the overall look. Usually crafted in Kundan, it is embedded with emeralds and uncut diamonds. 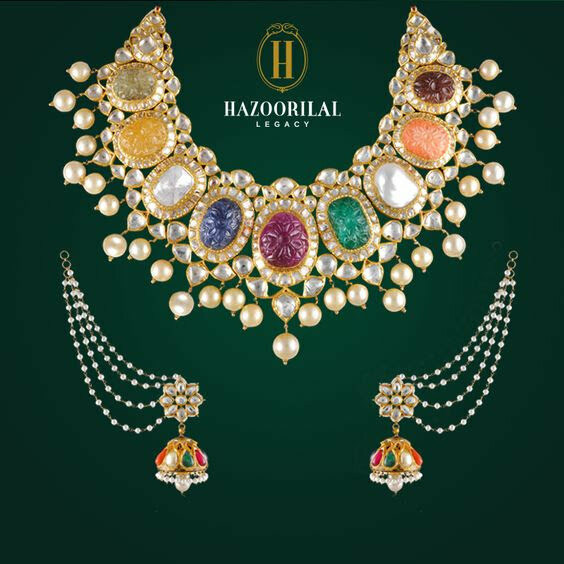 At Hazoorilal Polki Jewellers, you can find royalty imbued in every piece. The kind of Minakari and polishing required is often the domain of only the best craftsman. Woven with multiple sided filigree, the neckpiece is woven into seven layers of pearls or gems, the style is usually 30 to 35 inches long, beginning at the neck and working up to the navel. Styling for a wedding is a complex equation that combines personal choice with individuality. Since weddings are a lifetime affair, you must check out the latest Polki Jewellery designs, at jewellers in South Delhi. The area is known for its fine craftsmanship, often a product of legacies passed on to future generations, that never fails to stun in terms of design and durability. Since the right neckpiece can help you enhance your look considerably by highlighting your features and setting off against your skin tone choose your jewellery wisely with these tips. Jewellery forms the most integral part of your wedding, so choose it with care. Here is a guide to help choose the best that would suit and compliment your silhouette.